CMS vs Frameworks – Which One Should You go With? There are a few different ways you can build a website. Choosing the most advanced option out there isn’t necessarily the best way to go. What matters is the end result. The priority is having a website up and running that serves its purpose and does everything you expect it to do. But depending on what purpose your website has, there are various options out there. 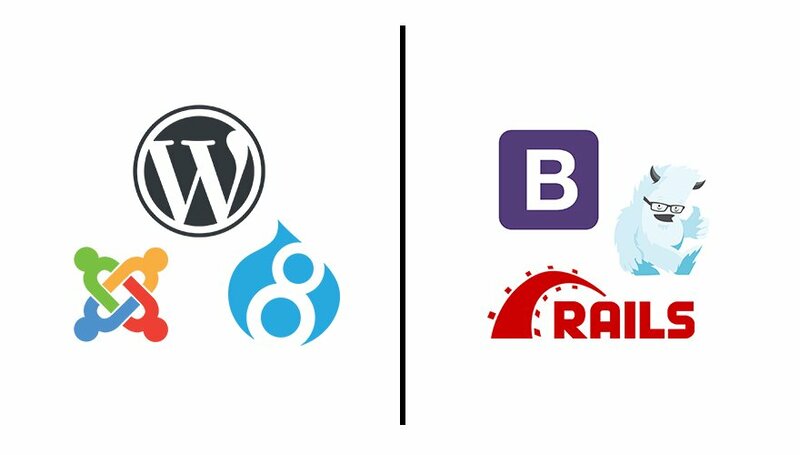 In this post, we’re going to compare building a website using a CMS (like WordPress) vs code frameworks (like Ruby On Rails and Bootstrap). Note: It’s important to make the distinction that when we say “framework” in the context of this post, we’re not referring to a WordPress theme framework, but instead a standardized library of code for building websites from the ground up. There are two types of frameworks out there. Frameworks that help you build the backend of your website (e.g. Ruby on Rails) and frameworks that allow you to set up the frontend (e.g. Bootstrap.) Frameworks that are used for the frontend are often called CSS Frameworks. How Do CMS Platforms Work? CMS platforms are web applications built upon frameworks. It’s kind of an inception thing where people have built a web application (e.g. WordPress) to allow you to build websites more easily and visually. When using a CMS, the backend and data layer structures are already taken care of. These two things require a lot of code knowledge, so that part is taken out of your hands. However, that also means your website’s frontend will only be able to handle what your backend allows it to. Usually, developers create their own web applications using frameworks when a customer’s need cannot be met with a CMS platform. 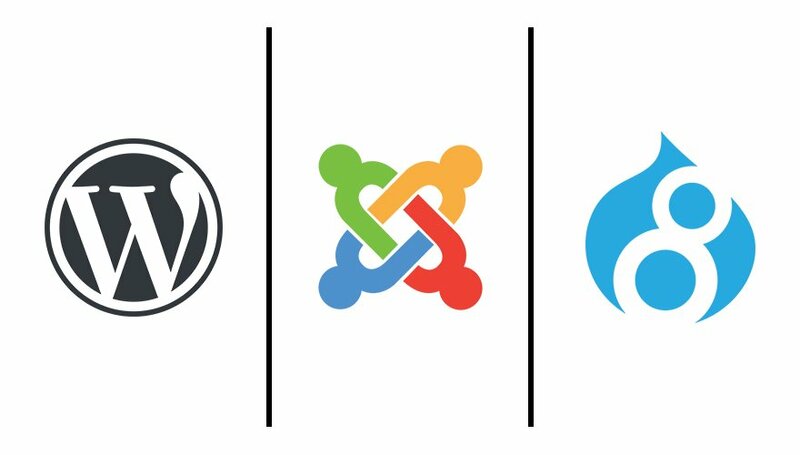 To help you decide if you should choose a CMS, such as WordPress, or if you should go with frontend and backend frameworks, we’re going to compare both options. To make an accurate comparison, we’ll use 5 different metrics. The first one being flexibility and level of control. WordPress, for instance, does a great job at offering you different ways to design your website. Especially if you consider all the WordPress themes, builders and plugins out there that help you get a lot of things done. You can design beautiful websites with great functionality. WordPress doesn’t limit you to creating simple websites only. With the right plugins and themes within reach, you can build membership websites and eCommerce websites that have great user experience. Although a CMS can help you built various websites, it’s not as advanced as frameworks are. With frameworks, the sky is the limit. You can decide what your website needs and make your entire development process revolve around it. You can build whatever you had in mind and you won’t be limited as long as you have the time, resources and knowledge for it. Ease of use is the second metric we’re going to handle when comparing CMS platforms, like WordPress, with frontend and backend frameworks. When it comes to using a framework or a CMS, using a CMS is definitely a lot easier. CMS platforms do the hard work for you. They take care of the backend and the data layer and allow you to focus on how you want the frontend to look. In many cases, you don’t even need to know how to code at all to set up a website using a CMS. Plus, if you look at all the WordPress page builders out there, such as Divi, building a website has become as simple as dragging and dropping design elements onto your pages. Frameworks have done a great job at making things easier for website developers as well. Instead of having to code literally everything from scratch, there’s a foundation people can use. Many CSS frameworks, such as Bootstrap, offer templates for people to use. But for someone who’s barely gotten in touch with code, going that route is a risk to take. It goes without saying that building a website using frameworks obviously takes up a lot more time than building a website using a CMS platform. Luckily, it does take a lot less time than creating a website from scratch using no frameworks at all. But although CMS platforms take some of the hard work over, it definitely isn’t the same as working with a website builder such as Weebly. A CMS platform allows you to, and sometimes even requires you to, make custom modifications using custom code when you want to achieve a more advanced result. But in reality, there are a ton of themes, builders and plugins out there that help you minimize your workload. Know that whichever one you pick, it takes a huge amount of work, time and effort to build a website with great user experience. But building a website with frameworks is harder because of the coding knowledge it requires and the freedom you have of getting everything set up just the way you like it. Whether you’re creating a website using a CMS platform or a framework, the budget you have will play the biggest roles in your decision making. Budget and time are barely separatable. Full stack developers usually charge anywhere between $30-$150 an hour to create a website. Web designers, that use CMS platforms to create websites, charge between $20-$75. Besides those numbers, you should take into account that custom coding a website using frameworks takes more time than creating a website using a CMS platform. The more complex and customized you want your website to be, the more expensive. This counts for both CMS platforms and frameworks. But there are a lot more DIY website creators out there that design their own website instead of hiring someone to do it. Both CMS platforms and frameworks (especially open-source ones) have one main vulnerable spot. Their code is public to the world which means that attacking them is easier for hackers. But in cases where CMS platforms are built upon open-source frameworks as well, the public code is double the amount which makes a CMS platform even more vulnerable. Luckily, experienced developers contributing to CMS platforms and developers contributing to frameworks keep an eye on security threats and hop in as soon as possible to keep improving security day by day. Fighting security threats is an ongoing thing but both manage to reduce the risk users have to take when choosing one of them. In this post, we’ve compared using a CMS vs frameworks to build your website. We started by explaining how both methods work and afterwards, we’ve compared them using several metrics. In the end, it’s about which one of the possibilities matches your needs the most and what your budget allows you to use. If you have any questions or suggestions, make sure you leave a comment in the comment section below! The post CMS vs Frameworks – Which One Should You go With? appeared first on Elegant Themes Blog.